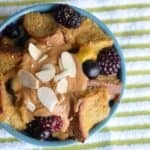 Have your french toast and oatmeal too. 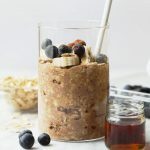 Make Maple French Toast Vegan Overnight Oats for an easy, make-ahead breakfast that’s packed with maple and cinnamon flavor! 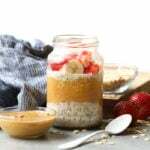 This healthy vegan overnight oats recipe is high in fiber and whole grains. 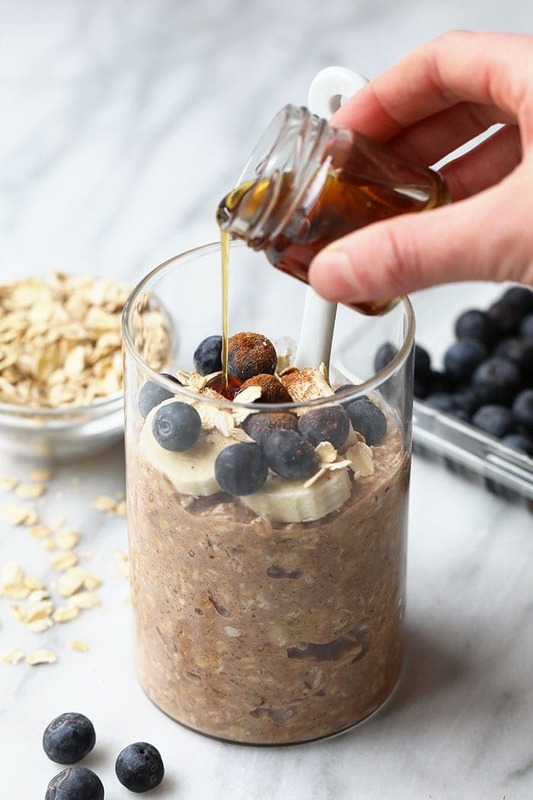 Day two of Overnight Oat Week is all about MAPLE! Why? Because french toast + maple = love. So much flavor in one bite! The texture turned out amazing. 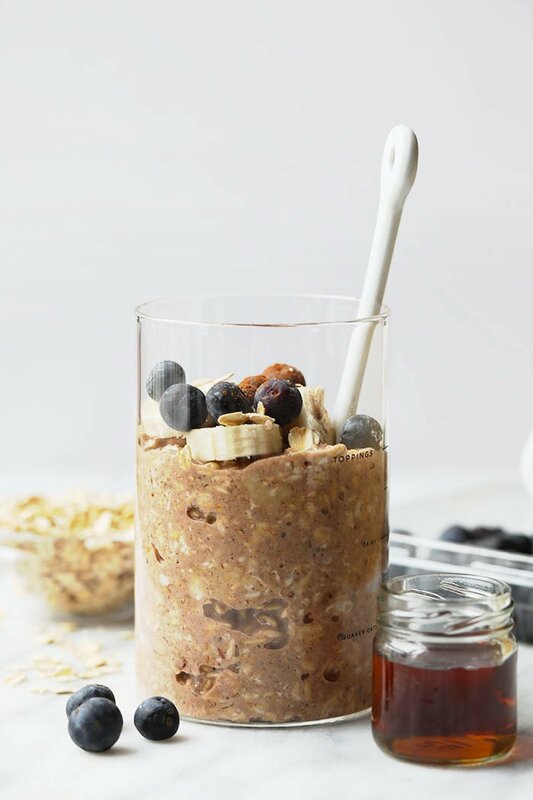 I opted to leave Greek yogurt out (which I typically like to add into my overnight oat recipes) so that you could really taste the maple/banana/cinnamon combo. 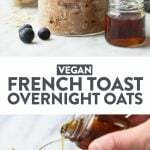 This also means that this overnight oatmeal recipe is vegan. 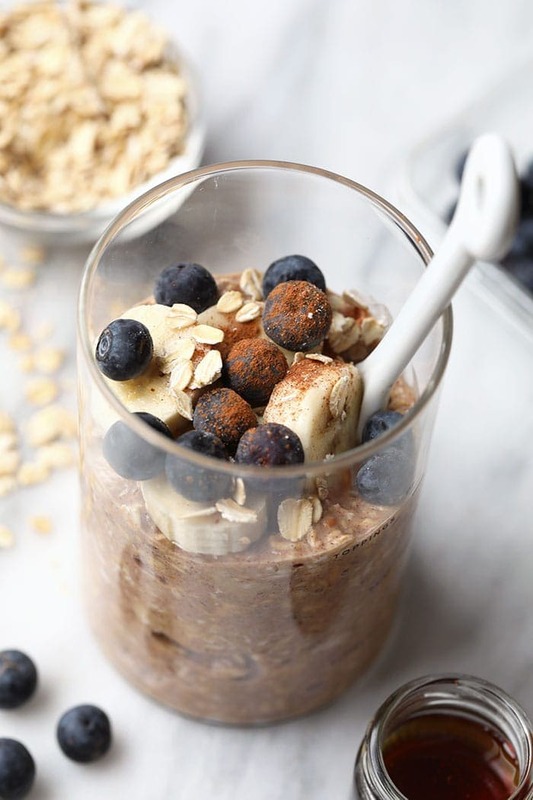 Oh, and gluten-free too if you use g-free certified rolled oats. I highly suggest eating this breakfast with a giant cup of coffee. In a medium-sized container, mash 1/2 banana. Then, mix in the rest of ingredients and let sit for at least 2 hours or overnight. Serve with fresh berries, sliced banana, and ground cinnamon. 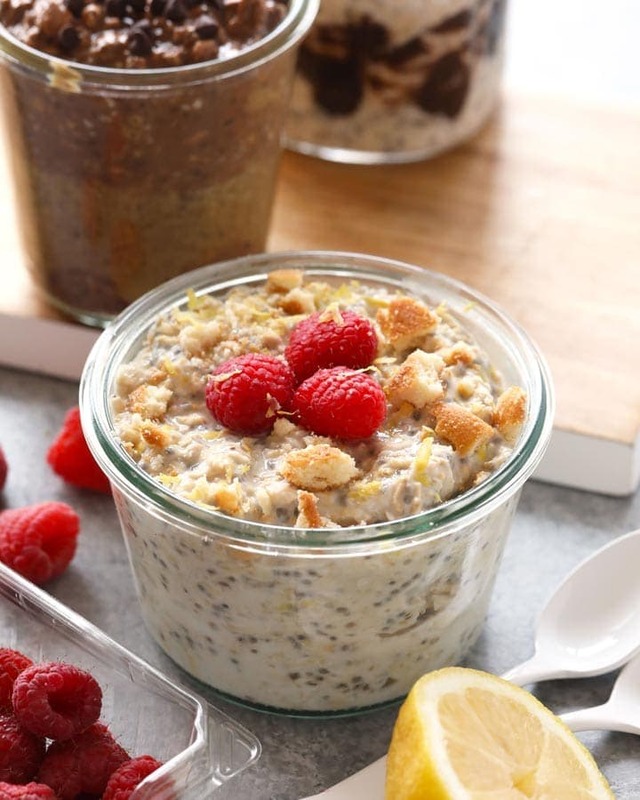 Store overnight oats in an airtight container in the refrigerator for up to 3 days. Want to know some fun facts about Maple Syrup? 71% of the world’s maple syrup comes from…CANADA! Maple syrup is 100% pure and natural…which is why I LOVE it so much. 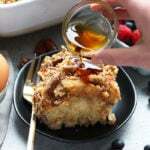 Maple Syrup can serve as a 1:1 replacement for any liquid sweetener such as honey or molasses. Maple Syrup contains 100% of the daily value of manganese. 1 tablespoon of Maple Syrup is only 50 calories. Fun Fact #2: In high school, I was voted best dressed. …Which is extremely ironic because I pretty much only wear workout clothes and scarves back in those days. Boy, have times changed, right? In high school, I used fashion as a form of creativity and expression. I la-la-loved putting together fun outfits, and I even learned how to sew when I was 12. I asked for a serger for my 16th birthday and made all sorts of cool things. 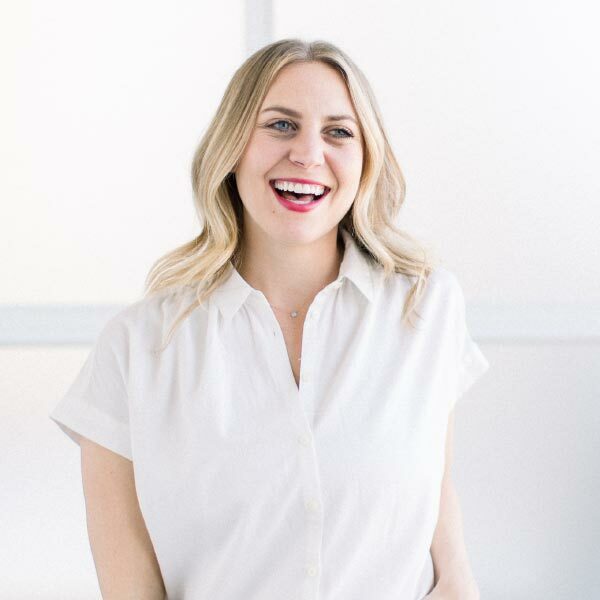 For a while, I wanted to be a fashion designer…which is what I ORIGINALLY went to the University of Minnesota for. That major lasted for about 14 seconds, as did like 50 other majors :D Today, a lot (most of) my energy is focused on food and design. Can you see how my creative expression has shifted? Honestly- I wouldn’t have it any other way. I love workout clothes and workout clothes love me…BUT I do have a whole lot of fun dressing up, too! This post is sponsored by Pure Canadian Maple Syrup. I was compensated and all opinions are my own. Thanks for supporting Fit Foodie Finds!